Knowing your numbers is important, especially for kids who are still building their intellectual toolboxes. Numbers are essential for math, of course, but they are also one of the basic building blocks of basic communication which can help when you are trying to offer information or receive it. Among learning their colors and letters, numbers are one of the basics when it comes to childhood education and our newest personalized book can help kids learn their digits in a fun and personal way. With I See Do You See? 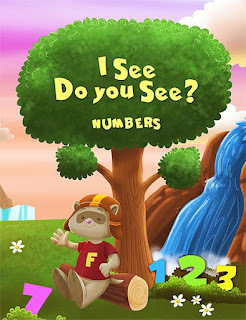 Numbers your child can embark on a thrilling adventure with their furry friend Fifel to find numbers using animal recognition. Books are incredibly interactive and versatile tools for learning, so introducing children to books as early on as possible is essential. Literacy is essential to learning, especially since there is so much knowledge in books. I See Do You See? Numbers is a personalized book that sets your child at the center of their own adventure – learning numbers 1 through 10 has not been more exciting! By incorporating literacy and other visual cues such as animal recognition, kids are bolstering their brain power in many different ways, and it is all happening in a creative and imaginative way. Personalized books also add another interesting element to the mix. If your child happens to be a reluctant reader, seeing their name in print or hearing it when read aloud may help to spark their interest. Books are highly interactive, but for a lot of children they may not pose enough initial interest and may see the endeavor as a lot of work, especially if they do not quite know how to read or cannot read very well. Encouraging kids to read through a more personal avenue, may make them more likely to pick up a book and dive into it on their own. Self-actualization is important for some kids – if they get the idea that something is possible and imagine themselves accomplishing it, they are more likely to try and learn how to get better at it until they can actually achieve it. For our other books in the “I See Do You See? Series check out our alphabets personalized book starring your child and Fifel in an alphabet adventure.